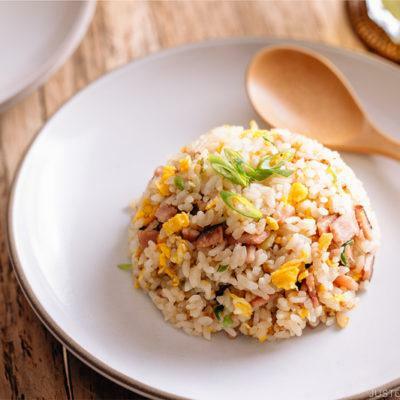 This classic Fried Rice recipe with ham, egg, and green onion is a delicious one-pan meal that you can whip up under 20 minutes. It’s bursting with flavor and perfect for a weeknight meal. Whenever I need to get lunch or dinner on the table fast, fried rice often comes to mind. With just a few well-chosen ingredients in the pantry and some leftover rice, I’d be ready to cook up a satisfying bowl of meal in less than 20 minutes. It’s so fulfilling that it can carry me throughout the day. So, when you are thinking of a Chinese takeout to solve your dinner problem, remind yourself that it’s always a better idea to make fried rice at home. 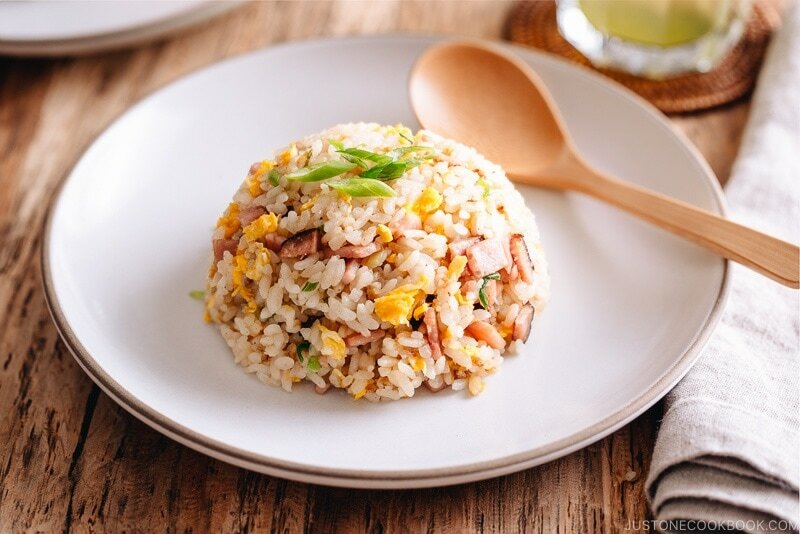 With my Easy Fried Rice(基本のチャーハン) recipe, you are guaranteed a delicious dinner and less waiting time. Fried rice in Japan is all made with short grain rice. It’s plump and sticky, and it has a chewy texture and more moisture content. Therefore, the day-old rice that has been dried out slightly in the refrigerator is the perfect vehicle for making fried rice. Just make sure to bring the leftover, cold rice to room temperature so it takes less time for the rice to heat up in the wok. A good bowl of fried rice is about simplicity. When I was first made fried rice in college, I tossed in way too many ingredients that my fried rice was more like a fried plate of mish-mash. The rice had no space to move around and it ended up with big chunks of rice with overloaded vegetables and proteins. So less is best for the case of fried rice. Rice is the key ingredient and the rest should be kept in minimal. Use a big wok or a pan with sufficient space to toss and turn the ingredients, and giving each grain of rice enough contact with the heat. If you have too much food, your fried rice will be stuck together like a giant mess. Also, keep the veggies and meat/ protein in smaller sizes so they will get nicely cooked together with the rice. Everyone has a different method to cook fried rice. Mine always start with making the fluffy egg. Pour the beaten egg in a pool of hot oil, and let the oil cook up the egg first. Take it out while it’s still somewhat runny. This way, your egg is never overcooked, waiting for its turn to be added to the rest of fried rice. You can cook the other ingredients and rice, then add the fluffy egg back into the wok or pan. It’s a fail-proof method for everyone. What other ingredients would work for fried rice? I have listed some here, but you can add whatever you have in your fridge. Keep your concoction simple. 3-4 ingredients would suffice. 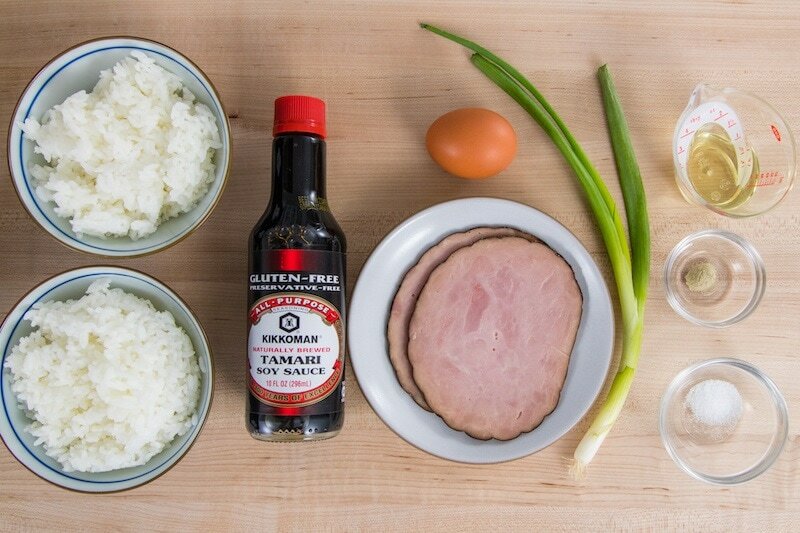 To make this Japanese fried rice, I used Kikkoman®’s Gluten Free Tamari Soy Sauce. 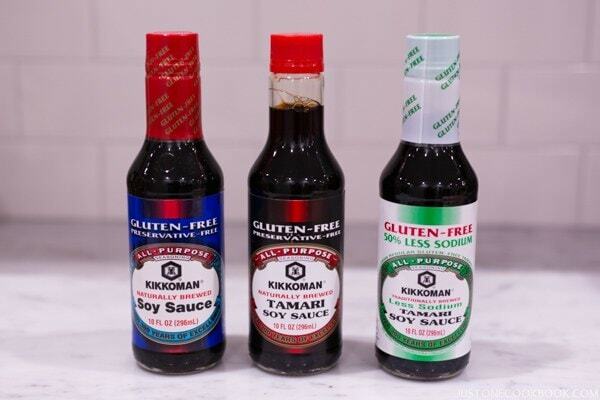 Kikkoman®’s soy sauce is known for an appealing aroma and rich color that stimulate the appetite. Their soy sauce works great when you add heat to it. 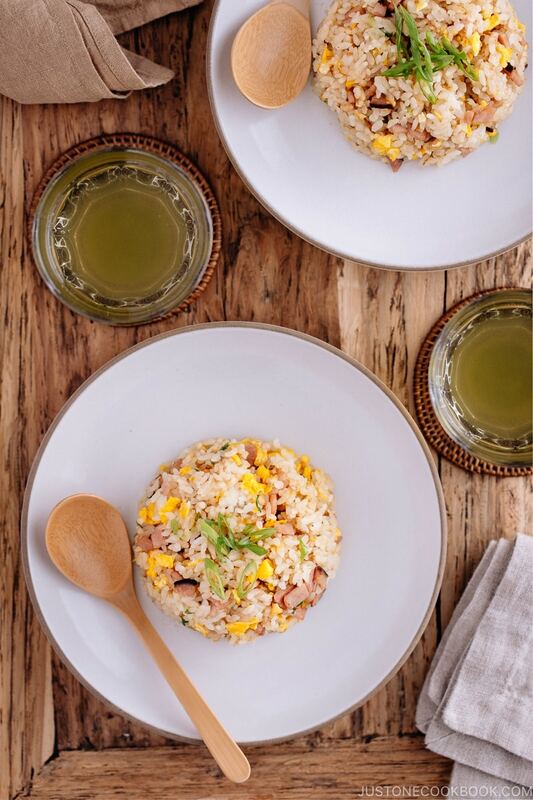 Fried rice cooked with Kikkoman®’s soy sauce adds a distinctly savory aroma, which lasts longer than other soy sauce. 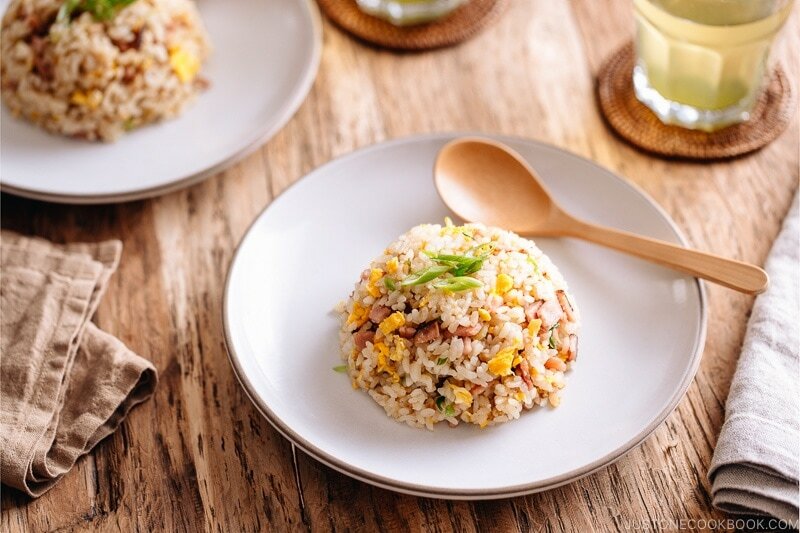 If you pack this fried rice in your children’s bento or your bring-to-work lunch box, you will get to enjoy the fried rice several hours later. 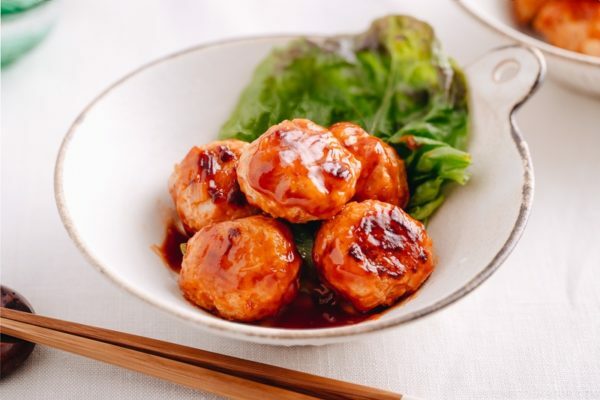 If you do not have to make this recipe gluten-free, feel free to use regular soy sauce (I often use Kikkoman® Organic Soy Sauce). 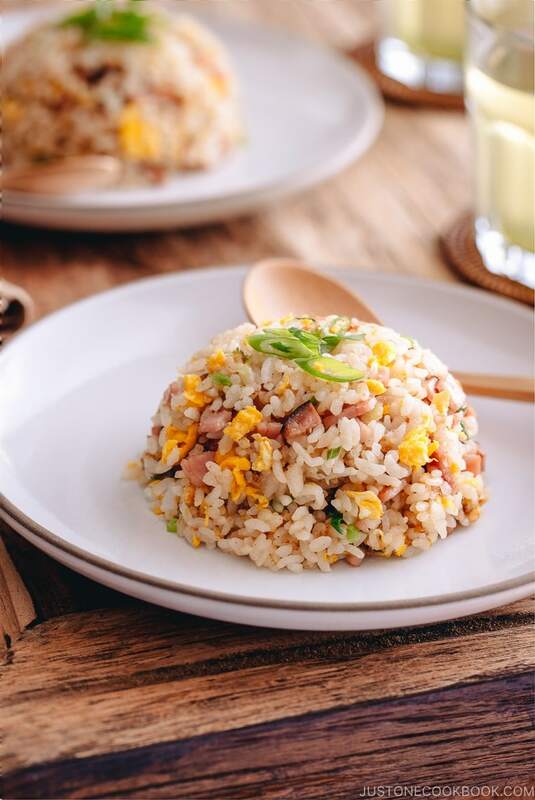 This classic Fried Rice recipe with ham, egg, and green onion is a delicious one-pan meal that you can whip up under 20 minutes. It's bursting with flavor and perfect for a weeknight meal. 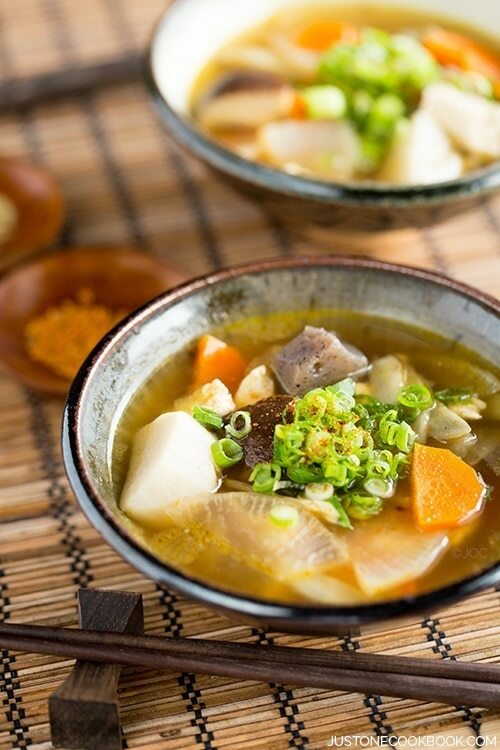 To prepare steamed rice, microwave your one-day-old rice that’s kept in the refrigerator until room temperature or warm. If you do not have one-day-old rice, then you can cook the rice, spread it out on a baking sheet lined with parchment paper, and leave it out on the counter without cover for 1-2 hours. This will remove moisture in the rice. Cut the white part of the green onion into rounds and the green part diagonally, dividing the white and green parts. Cut the ham into ¼ inch square pieces. Crack and whisk the egg in a bowl. Make sure all the ingredients are ready to go. Heat the wok (or the large frying pan) on medium high heat. Once it’s hot, add 1 Tbsp oil and swirl around to make sure all sides of the work (frying pan) are coated with oil. Add the beaten egg and mix around so that fluffy egg will be created. While some parts of the egg are still a little bit runny (not all the way cooked), transfer to a plate. We do not want to overcook the egg at this stage. Add 1 Tbsp oil and start cooking ham and white parts of the chopped green onion. Stir fry and coat well with oil. Add the room temp/warm rice into the wok (frying pan). Separate the rice with a spatula, without damaging the rice. Don’t make it mushy by pressing down, but fluff out the rice so it is coated with oil and gets nice wok char. Add the cooked egg back in the wok and break into smaller pieces while you combine with the rice. If some of the rice sticks to the wok, don’t worry (it happens when the oil was not enough) as you can scrape it off easily and creates nice char taste). 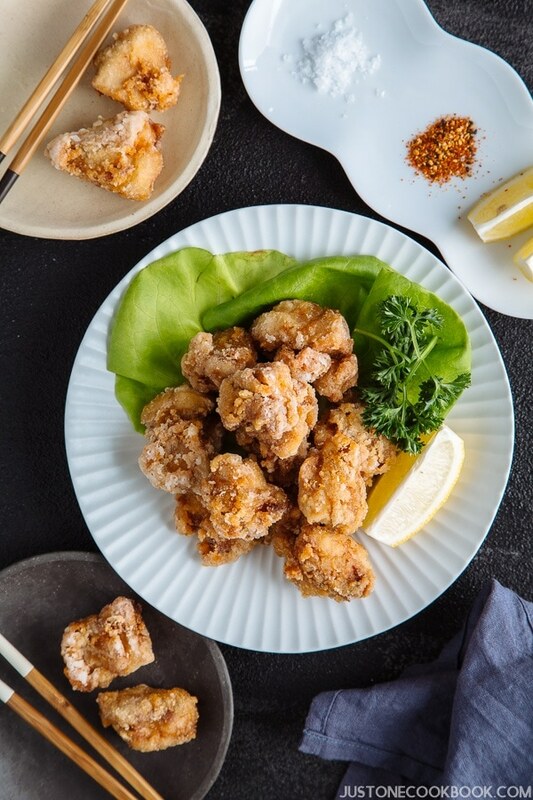 Season with salt and white pepper. You can add more later after adding soy sauce, if not enough. Add the soy sauce. The key action here is to toss the fried rice in the wok and make it fluffy instead of a big mess of fried rice sitting at the bottom of the wok. Add green parts of the chopped green onion. And after tossing a few more times, transfer to a plate. 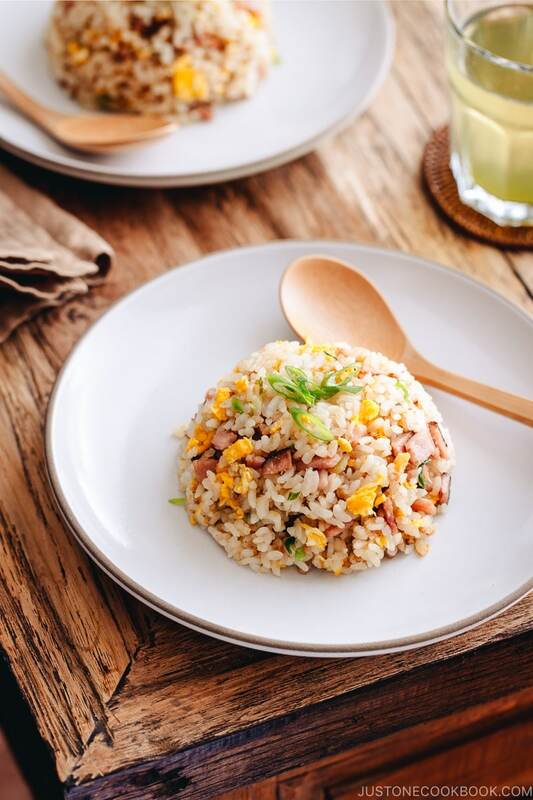 Fried rice at Chinese restaurants in Japan is often served in a dome shape. If you like to serve it this way, fill the fried rice in a rice bowl, pat down lightly to compact and invert onto a plate. 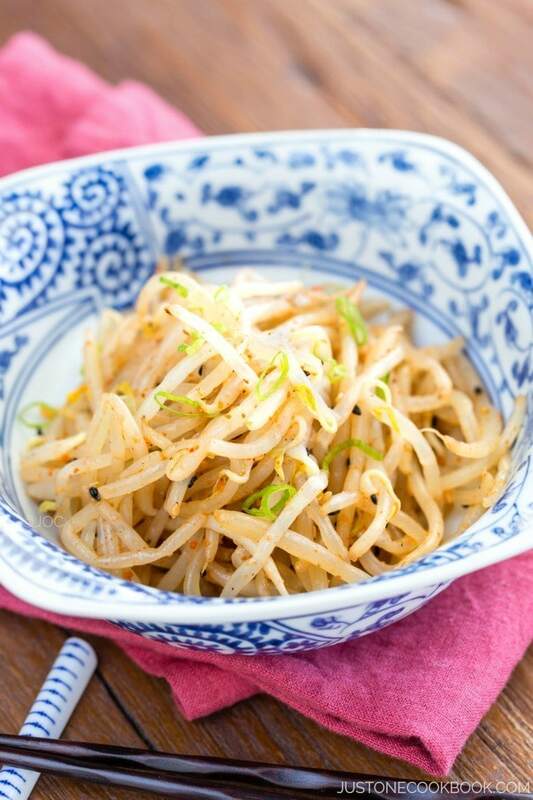 Sprinkle green onion on top, and serve! I love making fried rice. I usually leave the egg out and use bacon as the protein. It adds a lot of flavor to the rice! Hi Lauren! Oh I can imagine all the flavor from bacon! Sounds delicious! I made this fried rice tonight and was amazed at how good the end result was! I’ve attempted fried rice many times, and ran into the same problems you highlighted in the recipe (mushy, too many additions, etc.). This recipe was so wonderfully simple and delicious. I never appreciated how important it is for the rice not to get smushed or damaged in the process – with your clear instructions in this recipe, that didn’t happen. This was a fool proof recipe – thank you! Hi Emi! Your words are too kind. Thank you for following my recipe and I’m glad yours came out well. My tips are from my own experience, and I used to struggle with too much rice in the wok. I couldn’t make good fried rice until I was able to lift the wok/pan to fry out some rice. 🙂 Thank you again for your kind feedback, Emi! Thanks for the tutorial Nami! I make fried rice a lot for a quick lunch and whenever I have leftover rice. Your method is much better than mine. Always better to learn from the expert. Thanks! I thought that iceberg lettuce was only popular in the US because it’s cheap. But someone who says it’s their favourite? I never expected that. I suppose I’ve seen everything now. Then again, you often use white rice and white sugar, so I suppose you tend to like things nutritionally devoid. Personally I’m grateful that iceberg lettuce isn’t so common here in Canada. But I have noticed a local restaurant serving it in Gyudon. I want to find a different green that can be used instead for when I make it. Hi Liam! 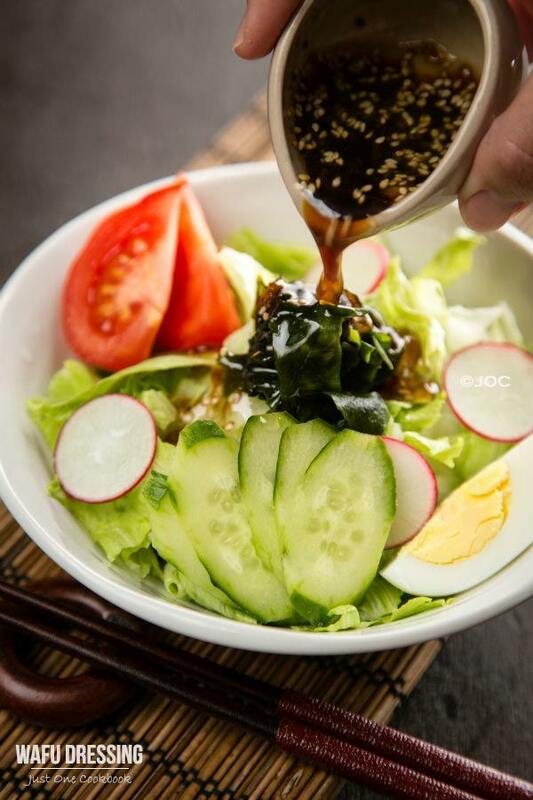 In Japan, iceberg is used for salad along with other types of lettuce. It’s just one kind of lettuce. We all know it’s less nutritious but it has a certain texture to it that works for some recipes. I’ve seen it’s used in Chinese fried rice in Japan or in the US. Maybe because they don’t want to waste the leftover from lettuce wrap? I am not sure. You can use spinach or bok choy or any greens you like instead of iceberg lettuce. 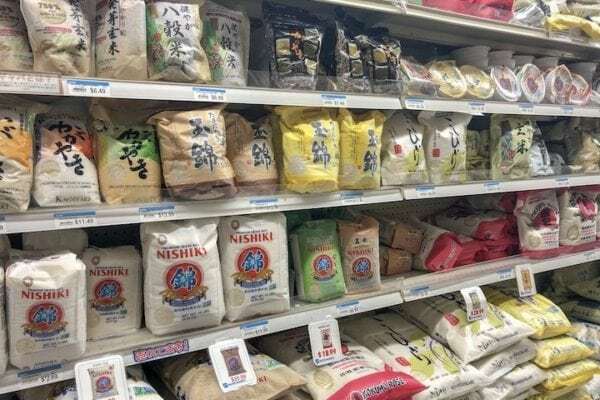 And as for white rice and white sugar, you can use brown rice and other alternatives but sweetener is necessary for Japanese cooking (or any Asian cooking) when you use soy sauce or miso, which is quite salty on its own. Wow, its the first time I made fried rice, which one isnt just a huge bulk of rice with some side vegetaibles! ITS acutually Fried Rice! hurrey! Its just lacking some spice, the next time I will try to put in some chilly powder. I made this tonight for my family. My 15 yr old loved it and went for a second helping. All your instructions and hints regarding the cooking part (don’t smash, don’t let it get mooshy) was extremely helpful. Mine came out light and fluffy. I think I will try chicken breast next time, but everyone really loved the ham.